"God look around His garden And found an empty place. He then looked down upon the earth And saw your tired face. He put his arms around you And lifted you to rest. God's garden must be beautiful He always takes the best." 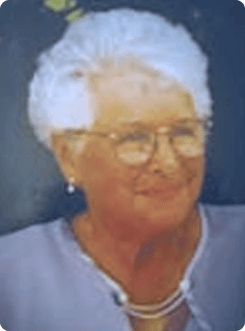 Noreen A. Weatherall entered into rest December 1, 2018. Born April 10, 1932, she was the daughter of George and Marion (Recor) Hoffman. Noreen worked at Lerch & Daly's for over 25 years, was a member of the First Presbyterian Church for over 62 years, enjoyed golfing, fishing, spending time in Sandy Pond, and especially being with her family. Predeceased by her husband, Raymond A. Weatherall, in 2001. Beloved mother of Scott (Denise) Weatherall, Diane Fura and Patricia (Kevin) Groff; cherished grandmother of several grandchildren and great-grandchildren; dear sister of Elizabeth Bobzein, George (Margaret) Hoffman, Sharon Podgers and the late Irma Hall and Michael Hoffman; sister-in-law of Charles Hall. Also survived by several nieces and nephews. Friends may call from 3-4 PM on Saturday at the First Presbyterian Church, 21 Church Street, where the Memorial Service will be held at 4:00 PM, with a reception to follow. Arrangements by Taylor and Reynolds Funeral Home, 70 Niagara Street. Condolences may be offered below, and flowers may be purchased through The Flower Barn. Word has reached us in New Mexico of Noreen’s passing. We offer our deepest sympathies especially to Scott, Diane, and Patricia. Through church and school, I have known you all for so many years. Nancy was at one time part of her care team, Ias I recall, Please accept our deepest sympathies– may the memories of you as a family together during the food times help you through these sad days.